As many of you have noticed, I am doing fewer solo shows these days. I’m always grateful for the chance to do one now and then, but the focus has been on my work with Brother Sun, the harmony trio of which I am one third. I would like to explain why this has been the case, both for those of you in parts of the country where the trio has not yet performed, and for those of you who are loyal fans who have graciously wrapped your arms around the trio. As many of you know I started touring full time in the year 2000. I graduated from conservatory in 1994 with a degree in Vocal Music Performance. I moved to Seattle to follow my dreams, and became deeply involved in the Folk and Traditional Irish music scene there. It was a time of immense growth. I was in an Irish band called Cunla. Some of you remember, Jeff Mills, Stesha Brandon, Richard Amerman, Kathleen O’Grady, Eliza James, Angeline LeLeux, and others who were in the band. We really had fun in Seattle, made some great harmonies and learned a lot about the ups and downs of making music as an ensemble. It was never easy, but it was always good. After various day jobs including sales in the marine industry, driving deliveries, driving fork-lifts, driving school buses (I see an emerging trend retrospectively), and finally a brief stint in Graduate school (Choral Conducting), I decided to make the break and hit the road full time. Music part time was just not enough. My home community in Seattle was AMAZING. I was supported and encouraged. A collaborative effort I helped found called Seattle Performing Songwriters really helped pave the way. Brad Warren, Marguerite Conti, Andrew Ratshin, Joe Crookston, Richard Middleton, Reggie Garret, and so many others helped me connect the dots via their own experience and knowledge, to building a full-time career. I will forever be grateful to the whole crew (19 in total) who comprised that musician’s collective. We traded ideas, helped each other find gigs, performed together, and helped each other think well about business and art. It was a fertile time, and the end result was that I was able to launch a solid solo career, touring all over North America. I am grateful also to David Lange/David Lange Studios, and Cary Black who (meaning to or not), taught me how to make records. And Puget Sound Guitar Workshop, where I connected with so many nationally recognized talents, and learned more and more about how to be a songwriter. Seattle Folklore Society, Victory Music, Three Rivers Folklife Society, Portland Folkmusic Society, The Seattle Labor Chorus, Dusty Strings Instrument Shop, and scores of friends supported me along the way. The Nenninger’s, The Beery’s, Jason Wood & Deb Seymour, Marge Young, and others guided and shepherded me in those early years, counseled and consoled. Most of all, my beloved wife and partner Lynn, my siblings and their families, and my In-Laws, the Hillbergs, cheered me on as I took a flying leap into the unknown. But the dream was never to be only a solo artist. The dream was to make AMAZING music, in whatever capacity, and to find a way for music to become the means by which I explored the world and paid my way while doing it. And as such… after 10 years on the road full time, I was ready for something different. I was not quite sure what, but I was ready for different. I needed new input creatively and personally to keep growing and evolving. I had figured out the business well enough… but I lost the thread of creative discovery somehow. We all do once in a while. In that fruitful yet pensive time, I crossed paths simultaneously with two profoundly talented individuals. Greg Greenway and Pat Wictor. While we had known each other for years on the circuit, the night we first sang together as a trio was a magical experience. And as the saying goes, when the student is ready, the teacher(s) appear. I had no idea what was just around the corner. But before I get too far ahead of myself, I would really like to more properly introduce you all to the gentlemen with whom I now share the road and the journey and the stage, nearly full time. 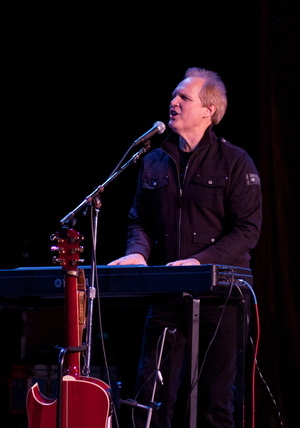 Greg Greenway is a long-time veteran of the road, and has had a prolific solo career. Once a Literature major at William and Mary, he brings quite literally volumes of poetic and literary knowledge to bear in his writing. He grew up in the South in the 60s, and was witness as a young person to epoch moments in our nations history. 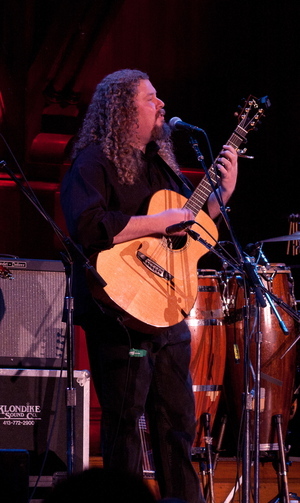 Steeped in Rock, Jazz, Gospel, Folk, and music of the civil rights movement, Greg brings a formidable musical intellect and facility to bear on any given piece of music or concert. Between guitar and piano, Greg (Groove-meister) Greenway always brings something new to the table. In addition to being one of the most generous people I know, he is eloquent, gracious, and a truly first rate songwriter. An innovator on Guitar (C9 Tuning), and absolutely fearless on stage, he can handle anything and not loose his cool. Quick with a laugh and a compliment, long on patience and perspective, steadfast and witty, Greg has become a true brother and friend. Pat and I regularly feel like we are getting schooled in how to do our work better, just by being in Greg’s presence. Pat Wictor and I have been dear friends for nearly a decade. But not until we started traveling together did I realize just how eclectic his musical and personal life has been. From Delta and Piedmont Blues, to old gospel, Prog-Rock to British Heavy Metal, John Coltrane to Mose Allison, Pat probably has it on his 200 gig hard-drive. (An IPod is not enough for Pat.) He is a kind, well-read, and well-travelled fellow, with a background in Grass-roots Organizing, History (his original major), Shakespearian Literature, and education (NYC Public School Teacher). But it is his insatiable curiosity for all things past and present, his desire to make connections between divergent ideas and places, and his ability to soundly reason not just react, that distinguish him in conversation. 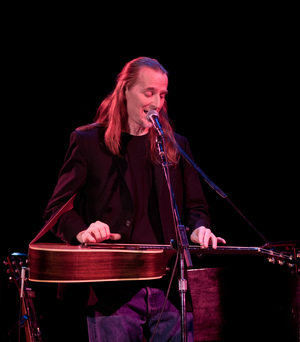 Of course, what most people know Pat for is his incredibly innovative slide guitar styles. He has developed a way of playing that is outright amazing. He has such control of his instrument that during one tour stretch, where he had lost his voice, Pat played his parts to near perfection on the slide guitar--- on the fly. The audience swore it sounded like three people singing. We had all known each other for years on the circuit. We crossed paths at conferences, and festivals and collaborated together in pairs on and off. Pat and Greg knew each other through the Phil Ochs Song nights (a traveling celebration of the life and work of the late great Phil Ochs). Greg and I crossed paths in the Unitarian Universalist world most frequently. Many of you know Pat from the fabulous playing he did on two of my solo CDs (The Candle & The Flame, and Links In A Chain). We had done numerous solo shows together, and I had helped create numerous harmony arrangements on two of Pat’s CDs (Heaven Is So High, and Sunset Waltz). We knew we enjoyed making music together. But in the summer of 2009, all three of us were at the UU Summer program (SUUSI – Google it, it’s interesting), and we had the chance to sing together for the first time. Pat was doing a featured concert, as Greg and I had also done when we first came to SUUSI. Pat invited us to sing with him during his set, and magic happened. We were in a 500-seat theater, and when we sang certain chords we could feel the ripple affect in the house. There was something mystical and powerful in the blending of our voices. All three of us immediately felt it. It was a total WOW moment. We knew we needed to make more music together. And that is what we have done. We are well into our second year on the road together, and we have played nearly 200 concerts as Brother Sun. Our first record “Brother Sun,” rose to the top of the folk DJ Chart when it was released, and ranked in the top 10 for 2011, after only being in circulation for ½ of the year. Every concert we play, we learn from each other. Every rehearsal holds new discoveries. Every conversation brings more understanding of the self or the world, or both. We have found a genuine personal and musical partnership that promises to bear fruits for years to come. Not since conservatory, where I was singing Madrigals one minute, Vocal Jazz the next, Beethoven’s 9th in the morning and Fiddler On the Roof at night, have I experienced such stylistic diversity and challenge. Unique to Brother Sun, in my personal experience, is the depth to which we go to pursue a truly co-equal and collaborative process. Not always a tidy journey, but pursued with sincerity; we strive for transparency (fairly easy) and clarity in communication (harder). After years of singing and writing and marching and protesting and advocating and preaching and longing for a more cooperative society, I am finding ways to bring that spirit of community into my professional life on a daily basis. A challenge? You bet. Worth it? For sure. Pat and Greg are two of the finest musicians I know, and two of the biggest hearted men I have met in my journeys. We are all excited to unlock the possibilities that exist musically between us. 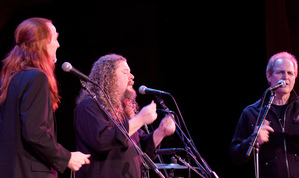 From traditional Appalachian and Celtic folk, to old school and modern blues, from heartfelt ballads and love songs to modern acoustic jazz, we are doing our best to make every concert unique, every song fresh, and every note it’s best. Who wouldn’t want to be a part of that? Thanks for the continued support. If you don’t yet have the new Brother Sun CD, you can order it on line at the band’s website (www.brothersunmusic.com), or pick it up at a show. The next year has us in about 35 different states and a couple Canadian Provinces. So, I hope you will come listen (again) to the music that is now at the center of my life and my heart.